Deborah Graham, a member of the Steering Committee of Chicago Says No More, is Senior Advisor, Illinois State Treasurer Office. I started to advocate because I survived domestic violence. When I was a victim 24 years ago, there were few agencies readily available for me to seek assistance. There were no housing programs, so I lived in the shelter for eight months. I secretly had to save money. I was afraid my children would be taken away by the Department of Children and Family Services (DCFS). I was plagued with shame for a good number of years and kept silent. For the first time in 2003, I told my personal story to a woman to help her see there was a way she also could get out of a bad situation. At that time, I already was a legislator in Springfield. I did not want to publicly speak because victims always get asked, “Why did you stay?” I knew from experience why women like me did stay. We stay because ‘we/they’ truly’ do not know what to do. But as I started to share my story with others, I was surprised I got stronger. As I got stronger, I learned I did not cause the shame I was feeling. When I spoke this past October in front of the Chicago Metropolitan Battered Women’s Network at the Thompson Center in downtown Chicago, I described my inability to trust anyone. At first, I even was afraid to drive on the expressway. I encouraged the audience with my story about the woman who mentored me, who brought me out of my fear, who gave me a voice and told me the world was my oyster. Women on the Thompson Center plaza that day wiped away their tears. I realized the more I ventured out, the more I could encourage others to tell their stories. Then I got a call to join the advocacy and awareness building efforts of Chicago Says No More. I am pleased to be a member of this organization dedicated to addressing the challenges of both domestic violence and sexual assault. Because I stood up and told my story, it seems like everyone in the world knows who I am and who I was. I have experienced the freedom of being able to relay my journey and am hopeful other victims will come forward to seek help. If you are a survivor who has been reluctant to speak up—keeping in mind the many victims who might benefit from hearing your story—would now be the right time to join with us and tell others what happened to you? Deborah Graham is a member of the Steering Committee of Chicago Says No More and the Senior Advisor, Illinois State Treasurer Office. 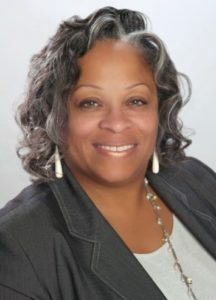 Ms. Graham is a former 29th Ward Alderman and was the Illinois State Representative for the 78th District in the General Assembly.